Olive oil is generated by grinding whole olives into a paste. Pressure is applied to the olive paste until oil separates from the paste. It takes an average of 45 pounds of olives to create 1 gallon of oil, depending on the size & type of olives used. 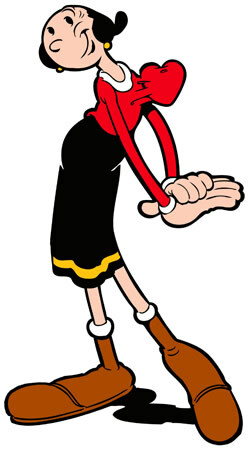 “Extra virgin” refers to oil that is generated from the first olive press. 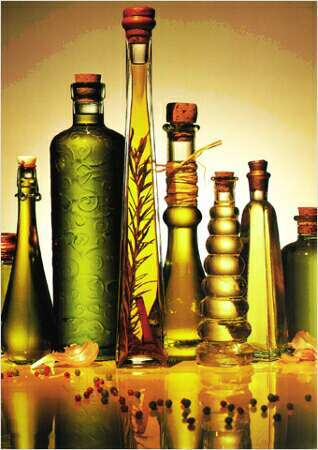 It is the most expensive & highest quality olive oil because it has not been altered or refined. The delicate flavor of EVOO, makes it ideal for use in salad dressings, soups & stews. Olive oil is rich in vitamins & antioxidants. When used topically, it slows the aging process by defending your cells against free radicals. Studies show that replacing butter & animal fats with olive oil in your food preparation will help lower HDL (bad cholesterol) & raise LDL (good cholesterol) levels in your blood. Exfoliator. Add ½ cup of brown sugar (or sea salt) to ¼ cup of EVOO. Use this all natural scrub to slough off dead skin cells. Eye makeup remover. I have not personally used olive oil in this manner, but I’ve read rave reviews about the ease of makeup removal. Added bonus: EVOO will condition the sensitive skin around your eyes & with continued use, can prevent wrinkles & thicken your eyelashes. Moisturize. Got scaly skin, ashy elbows, crusty cuticles or dry scalp? Don’t fret, it happens to the best of us… especially in the winter, LOL! Just rub some EVOO on any problem areas & you can kiss the dryness goodbye! Pre-poo hot oil treatment. Warm desired amount of EVOO in a bowl or a cup. Massage the oil into your hair & scalp. 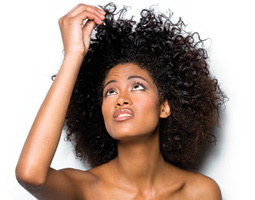 Wrap your hair in a warm towel, or plastic bag & let it sit for up to 30 minutes before washing. 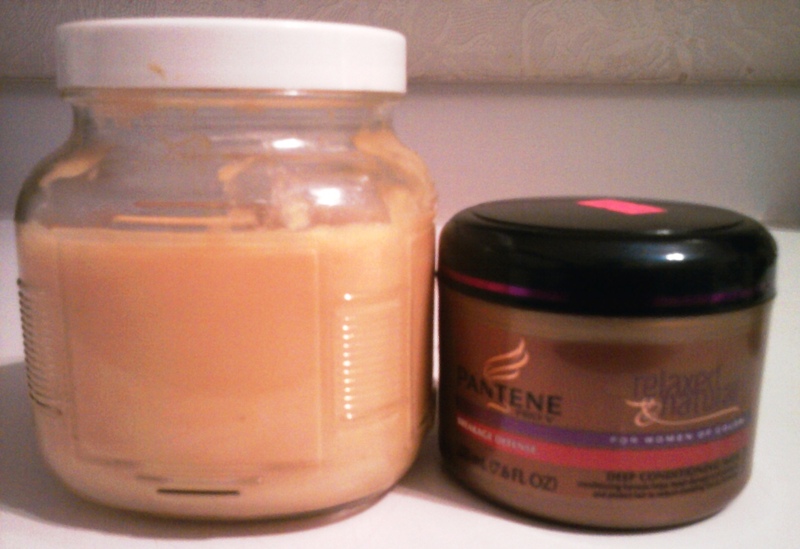 Deep condition. Add 1-2 ounces of EVOO to your favorite conditioner & apply to freshly washed hair. This is a cheap way to stretch out expensive conditioning treatments. The oil also provides additional slip, making detangling a breeze. 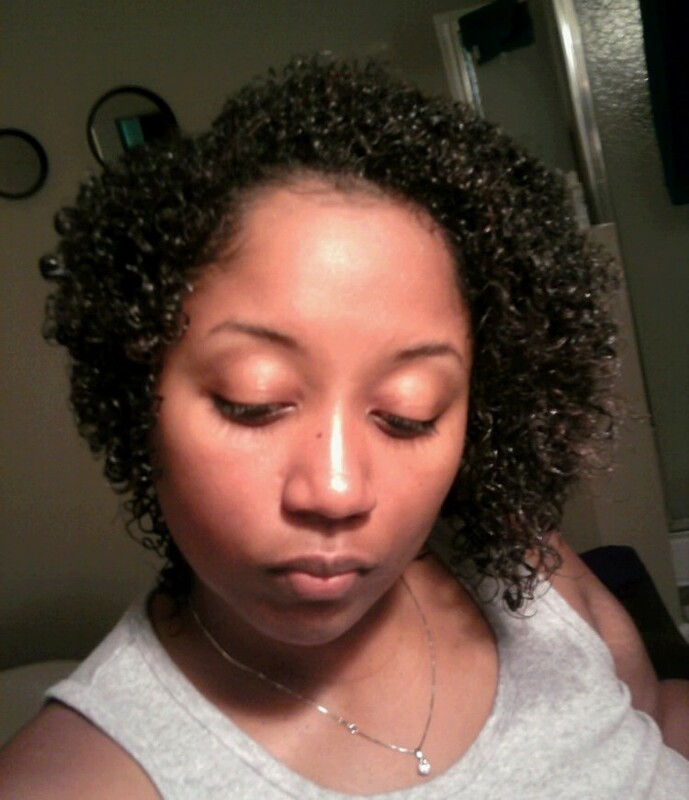 Wrap your hair in a plastic bag for up to 30 minutes before rinsing w/ cold water. * NOTE: I wouldn’t do an olive oil pre poo AND an olive oil DC in the same hairwashing session. Sealing ends. The tips of your hair are the oldest part, which means they’ve been exposed to the elements for the longest period of time & are more susceptible to damage than the rest of your hair. Using EVOO on the tips prior to styling gives your ends added protection against breakage. Have you tried olive oil? How do you use it? It’s that time again… HAIRWASHING DAY!!! I’m kinda ol skool in that I still scratch my scalp before I wash my hair. What can I say? Shampoo is more effective after debris has been manually removed from the surface of your scalp. I parted my hair, scratched the scalp & applied a thin line of Tea Tree Oil. 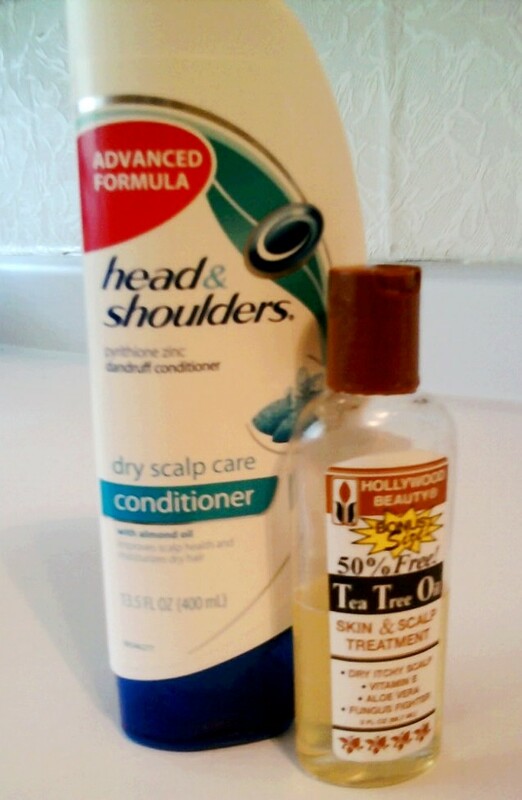 After my entire scalp was covered in oil, I applied Head & Shoulders dry scalp conditioner to the length of my hair & let it sit for about 15 minutes prior to washing my hair. Tip of the day: The surfactants in your shampoo (& conditioner) cleanse your hair by attracting & suspending dirt, dander & debris, so that they can easily be rinsed away with water. However, they require a little bit of manual friction to get the process going. If you’re dissatisfied with the performance of your shampoo, it could be that you need to put more elbow grease into your routine. DO NOT scrub your scalp until it bleeds (LOL)… just until it feels clean! 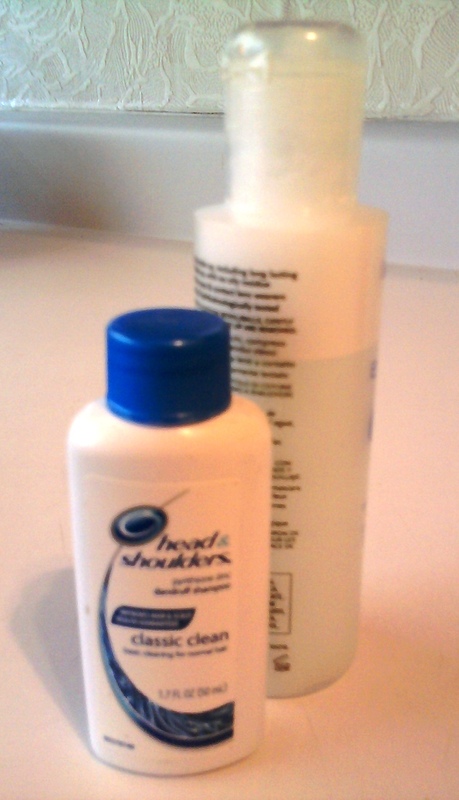 I poured a little less than a teaspoon of Head & Shoulders classic clean shampoo into a small (empty) bottle, filled it the rest of the way with water & shook it up. I used this diluted shampoo solution to wash my hair… poured it directly onto my parted scalp, scrubbed & rinsed until it was clean. 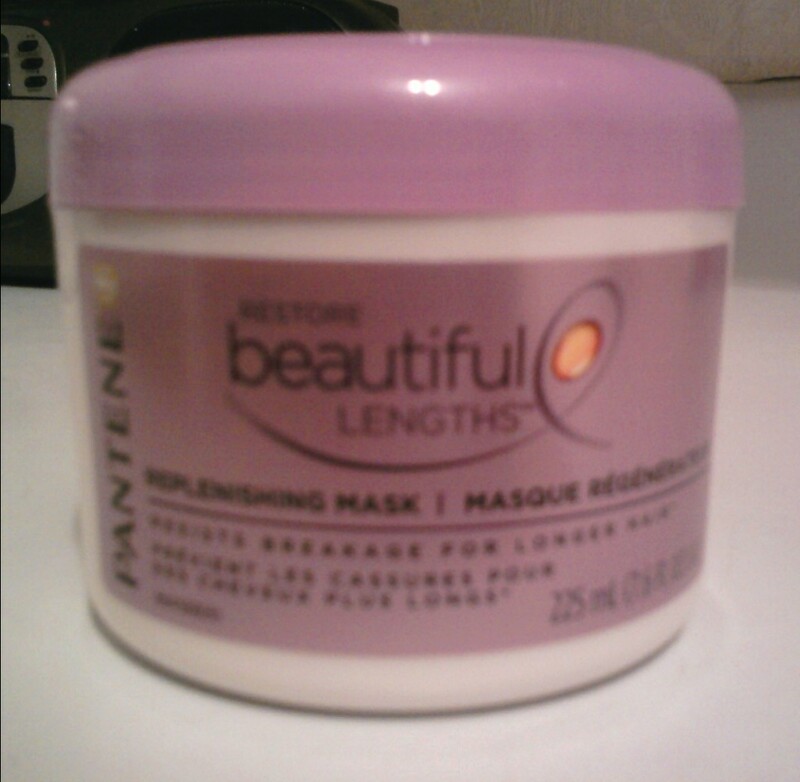 My grand debut of Pantene Pro-V Beautiful Lengths Replenishing Mask (YAY)!!! After towel drying my hair, I applied the treatment in sections until my entire head was covered. Then I detangled my hair in sections (using my TANGLE TEEZER), covered it with a plastic baggie & sat under the dryer (low heat) for 20 minutes & rinsed it out. My thoughts on this mask?!? I like it fine; unfortunately it’s no more spectacular than any other mask that I’ve tried. 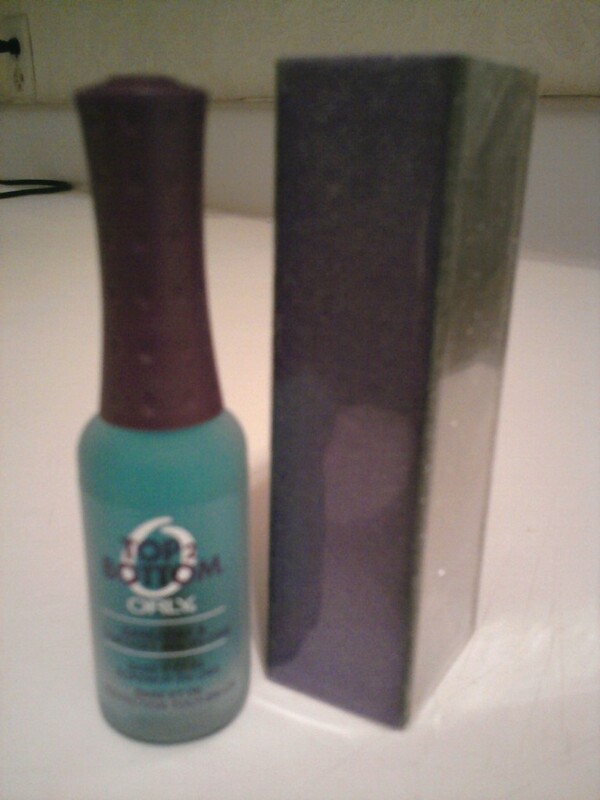 It smells amazing & provided excellent slip for detangling. I was a bit heavy-handed with it & used half the jar in one day on my shoulder length hair (SMH)… but I like it, so I’d buy it again. 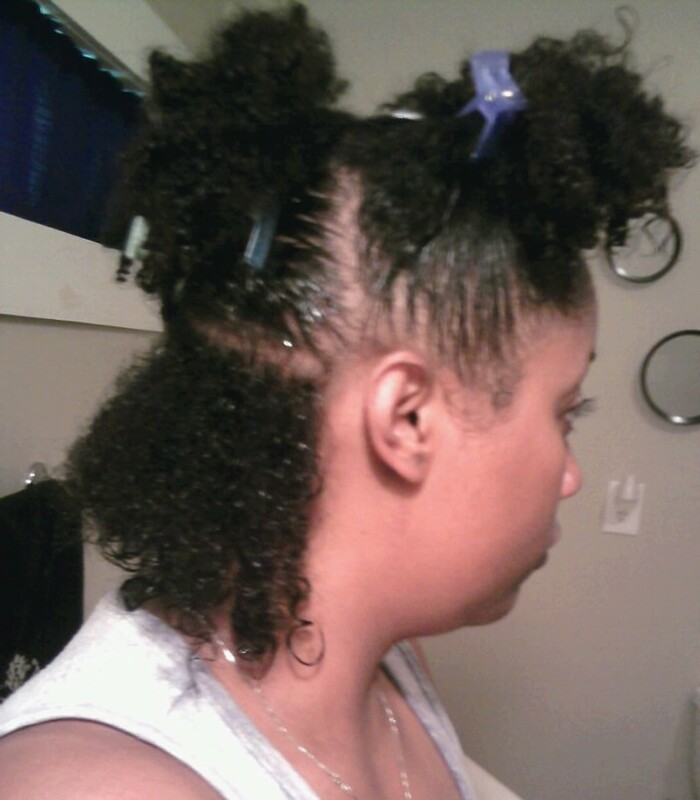 I divided my hair into about 5 sections, added product & rolled it up (back to front). 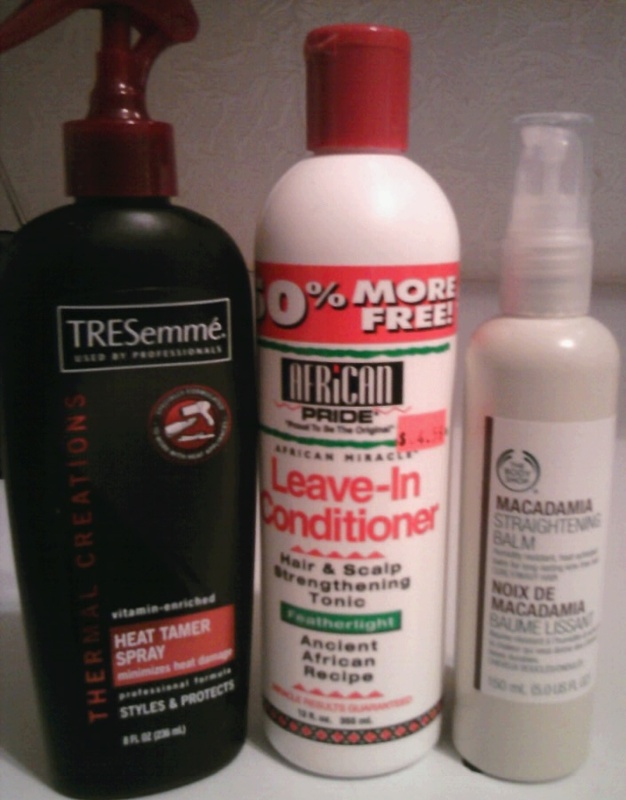 TRESemme Thermal Creations Heat Tamer Protective Spray, African Pride Leave-In Conditioner & The Body Shop’s Macadamia straightening balm. In a spray bottle I combined equal parts water & African-Pride Leave-In. 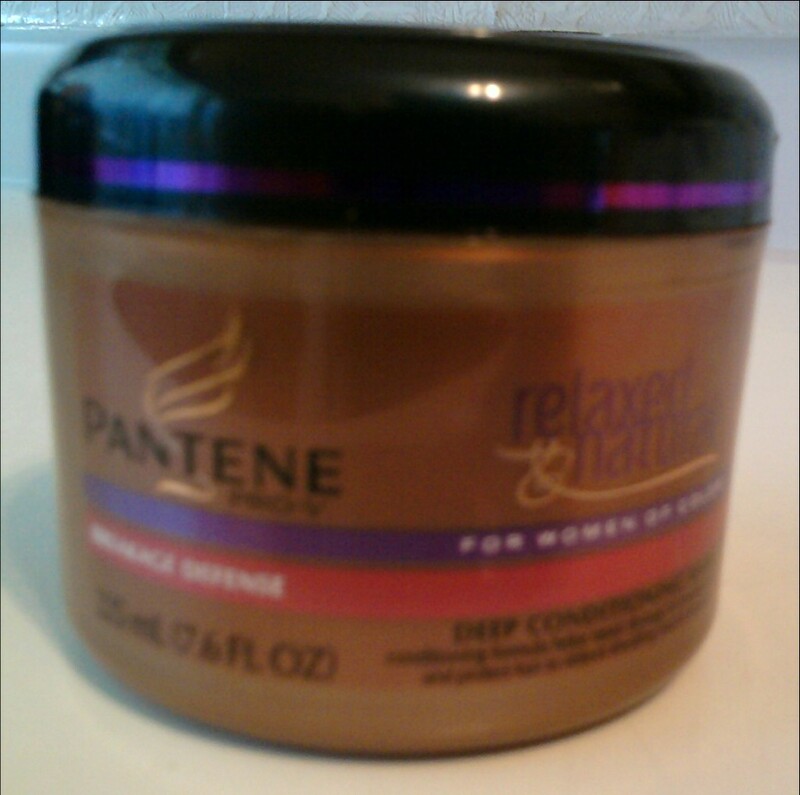 I did this because I prefer soft hold & it can make your hair hard, not to mention sticky, if left undiluted. 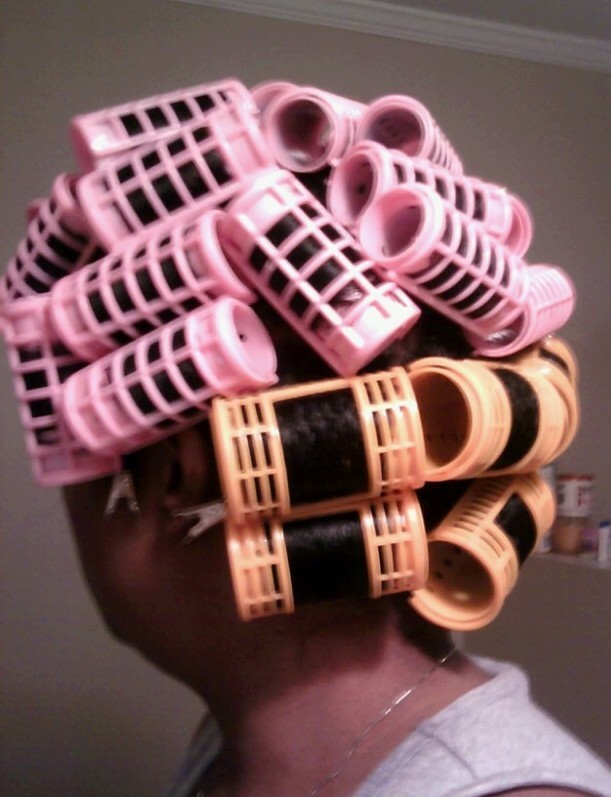 I applied all three products to each section of hair before rolling. 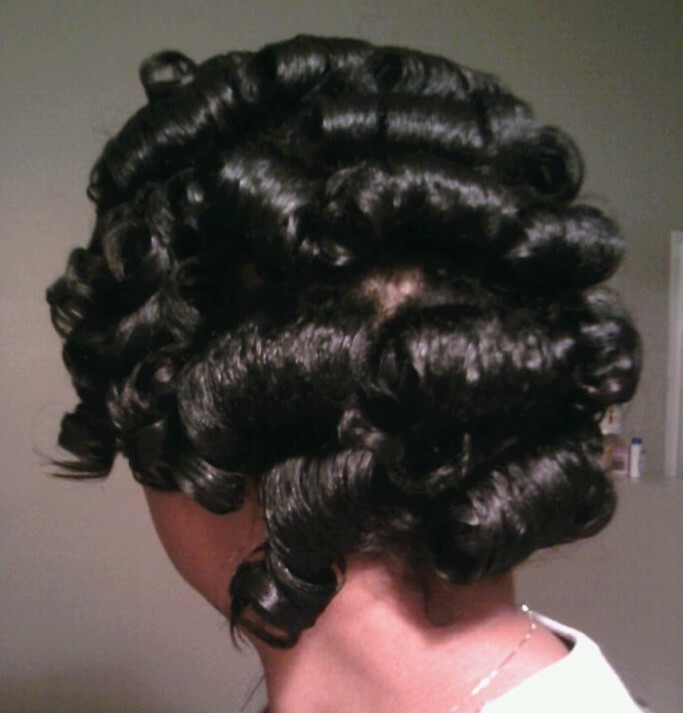 I used 1” diameter rollers on the majority of my head & 1 ¼” diameter rollers in the very back where my hair is longer. I roll my hair towards the back of my head, so the curls roll under. I haven’t decided how I’m gonna style it yet… I’ll post those pics later this weekend… HAPPY FRIDAY!